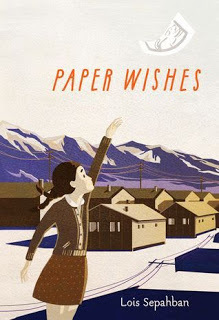 Paper Wishes by Lois Sepahban is a beautiful treasure of a story. Set in World War II, it tells the story of ten-year-old Manami and her Japanese American family. Manami and her family live on Bainbridge Island off the coast of Washington state until the Japanese bombed Pearl Harbor. As the armchair historians among you will recall, after Pearl Harbor Americans were suspicious of Japanese (and Asians in general). To preserve a sense of safety, the government allowed for the removal of Japanese American families to internment camps for the duration of the war. Such is the case with Manami's family in this piece of historical middle grade fiction. Paper Wishes begins after the attack on Pearl Harbor has taken place and tracks life with fictional families for the following year of upheaval and change as they are moved from the island to the Mojave Desert in California. Sepahban describes this experience to her readers chiefly through the characters of Manami, her parents, and her grandfather. Manami also has a brother and sister who are both away attending college in the Midwest. Through this family, the reader comes to understand how the internment camps effected entire family units and individual lives through use of creative story telling. Manami's family was given six days' notice before they were to be transported to the camp. They weren't told where they were being sent, they were only told that they could bring one suitcase each. Manami's mother packs and repacks their suitcases, deciding which clothes to take, which family heirlooms are important to hold onto, and has to think about what dishes they need to bring along to use for meals. Manami and her grandfather both share a special love for the family dog which they are required to say goodbye to, for dogs were not initially allowed into the camps. Leaving her dog Yujiin behind ends up causing Manami the most emotional distress, ultimately leading to such grief that she finds herself unable to speak. People in the camp understand her grief and it is generally understood that she cannot talk due to the stress and the pain of relocation and loss of home and normality. We understand Manami's thought processes, but her voice is removed from the story as it progresses. Through Sepahban's characters the readers come to understand how schooling was arranged for the children in the camps, how gardens were attempted, what jobs people might have taken on, and generally how life was lived in this bizarre captivity. Paper Wishes is a brilliant introduction to this period in American history. Although the treatment of the Japanese Americans can clearly be deduced as being unjust and unfair, Sepahban is not here to present a political argument. She tells her story with grace and humility, wanting us to understand and love the characters for their own sake. This, I found, was easy to do. I appreciated her straight forward manner of story telling which allows the readers to draw their own conclusions, avoiding any forced ideas or political arguments. The story speaks for itself, exactly as it should. Paper Wishes is a quick read for adults (it took me all of an hour and a half to consume). It should make for easy reading for burgeoning readers. I borrowed a copy from the library but I'll be purchasing my own to have in our home library. It's worth owning. If you are looking for a way to introduce your children to the plight of Japanese Americans during the war, I doubt you'll find a better story with which to do so. Beautifully told, this book is a memorable winner of a tale. Sounds like a very good book! More needs to be taught about the Japanese internment. I did not hear of it when I was in school, but have learned about it since then. Oh, this looks really good! I think Easton and Kiana might like this. We have been listening to some old Adventures in Odyssey recordings and Easton has been fascinated with Pearl Harbor and the idea of Japanese-Americans fighting for the US.